All cooking ingredients are measured with Metric style measuring cup set (1 cup = 250 ml ) size in all recipes on this website. Where to Buy Measuring Cup Sets? How to Measure Dry Ingredients? How to Measure Liquid Ingredients? Measuring cup set is an important utensil to have in the kitchen and it is always recommended to use it for all new recipes that you are trying. To get the best cooking results for recipes specified on our website, it’s necessary to measure all ingredients with metric style measuring cups and spoons and have them placed in the order of use (typically in the order of ingredients specified in the table) before starting on the directions. This will make cooking easier, reduce the chances of forgetting to add/use key ingredients and most importantly, loosing critical time in finding the ingredient while cooking process is already underway and recipe demands adding next ingredient at very specific stage and not over cooking. You can see the different types of spoons and cups in the photo given above. The typical cooking measuring cup sizes are 1 cup, 1/2 cup, 1/3 cup, 1/4 cup and 1/8 cup. The typical spoon sizes are 1 tablespoon, 1/2 tablespoon, 1 teaspoon, 1/2 teaspoon and 1/4 teaspoon. The jug (large container with measurement indication) is generally used for measuring liquid ingredient in large quantities. Sometimes, it’s easy to misplace parts of measure sets and following conversion information will help you derive the correct size. To measure dry ingredients like flours, sugar, semolina, spices powder, etc., fill the measuring cup or measuring spoon with the ingredient up to brim and then level it with back edge of a knife or a spatula. Many dry ingredients, such as granulated sugar, are not very compressible, so volume measures are consistent. However others, notably flour, are more variable. For example, 1 cup of all-purpose flour sifted into a cup and leveled with technique mentioned above weighs about 100 grams, whereas 1 cup of all-purpose flour scooped from its container and leveled weighs about 140 grams. Wherever required, our recipes also mention to use compressed or uncompressed quantities. Using a measuring cup to measure bulk foods, which can be compressed to a variable degree such as chopped vegetables or shredded cheese leads to large measurement uncertainties and it is recommended to chop the vegetables and fruits into pieces for a correct measure. To measure liquid ingredients specified in quantity higher than a cup, place a measuring jug (large cup) on flat surface, pour the liquid in it and check it at eye level to measure. To measure liquid ingredients specified in quantity smaller than cup, use tablespoons, teaspoons and smaller cups (1/2 cup, 1/4 cup, 1/3 cup). 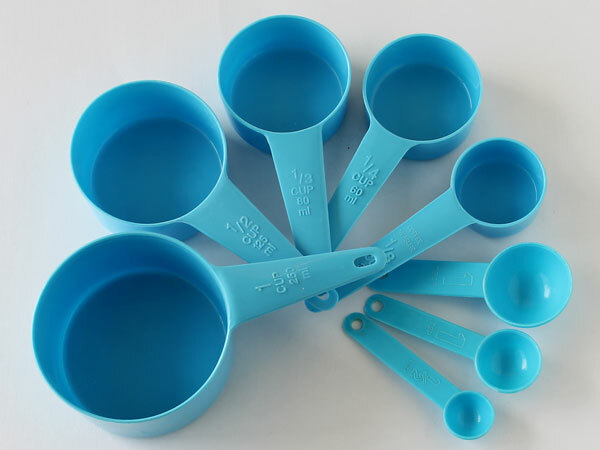 You can easily by measuring cups set and spoons from local utensil store or from online store. Click on the links given below to purchase it from your favorite website.